All good things must come to an end! But I’m far from being done with Nuclear Winter. 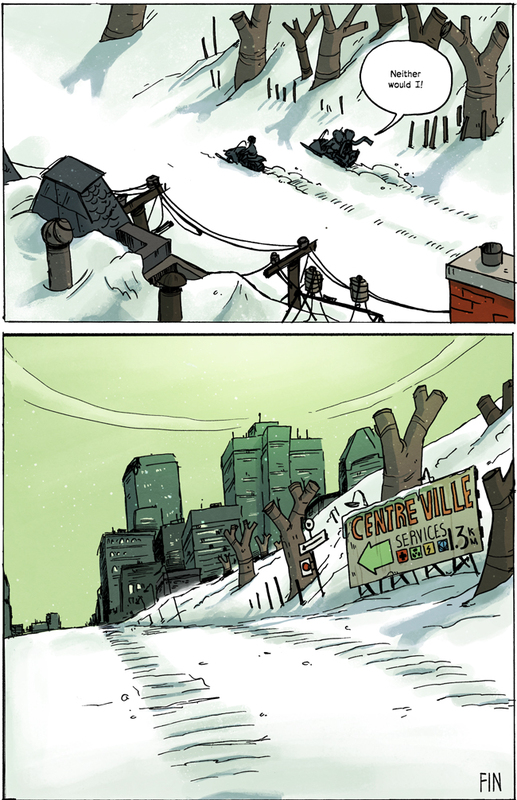 Front Froid will publish the entire comic in Novemeber (in French). The book will contain a prequel, exclusive drawings and sketches and much more! To keep up with the release date, to keep getting drawings related to the comic and to know my festival and book fair schedules, subscribe to the Nuclear Winter facebook page. A really big thanks to Boum, Mike Ditchburn, Phil and Carof, Jessie Dawn, the whole Front Froid gang, my family and friends and most importantly, thank you to all the readers! A special thanks to my dad, who knows better than I do what a skidoo looks like and for whom one page a week wasn’t enough. And now, maybe winter will finally end. Congratulations on finishing a great comic! I’ll read your next one too! I enjoyed it! It’s sad it was so short! Looking forward to whatever you do next! Oh no! I’m sad it’s over Any plans to release the book in english as well? Either way, thanks for making it! I enjoyed the story quite a bit and I’ll miss reading it every week! Enjoyed this comic a lot!! I am hoping the end goes hand in hand with the end of winter. Are you planning to make a sequel? If so, any idea when it will begin?